For this assignment, you will create a Jupyter Notebook with your answers to the questions below, and submit this Jupyter Notebook to a Github repository for Homework 4 following the instructions below Part II: Submit Your Jupyter Notebook to GitHub. You need to complete this assignment (Homework 4) by Tuesday, August 21st at 8:00 AM (U.S. Mountain Daylight Time). See this link to convert the due date/time to your local time. This assignment will primarily test your skills to notify others of pull requests on Github.com from Day 9 and to write functions from Day 10. Your skills will loops from Day 7 and conditional statements from Day 8 will also be reviewed. You will be asked to work with familiar data: temperature and precipitation for various months and years of data for Boulder, Colorado, provided by the U.S. National Oceanic and Atmospheric Administration (NOAA). 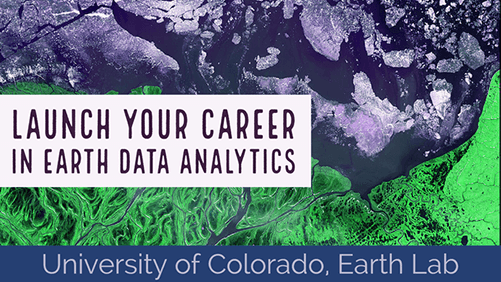 Be sure that you have completed all of the lessons from Days 7 to 10 for the Earth Analytics Bootcamp. Completing the challenges at the end of the lessons will also help you with this assignment. Review the lessons as needed to answer the questions. You will need to fork and clone a Github repository for Homework 4 from https://github.com/earthlab-education/ea-bootcamp-hw-4-yourusername. You will receive an invitation to the Github repository for Homework 4 via CANVAS. Note: the repository will be empty, as you will add a new Jupyter Notebook containing your answers to the questions below. Begin by creating a new Jupyter Notebook in your forked repository from https://github.com/yourusername/ea-bootcamp-hw-4-yourusername. Rename the file to firstinitial-lastname-ea-bootcamp-hw-4.ipynb (e.g. jpalomino-ea-bootcamp-hw-4.ipynb). Note that Git will recognize this new Jupyter Notebook as a new file that can be added, committed, and pushed back to your forked repository on Github.com. Start with Markdown cell containing a Markdown title for this assignment, plus an author name and date in list form. Bold the words for author and date, but do not bold your name and today’s date. Add a Markdown cell before each code cell you create to describe the purpose of your code (e.g. what are you accomplishing by executing this code?). Think carefully about how many cells you should have to best organize your data (hint: review lessons for examples of how code can be grouped into cells). Within code cells, be sure to also add Python comments to document each code block and use the PEP 8 guidelines to assign appropriate variable names that are short and concise but also clearly indicate the kind of data contained in the variable. In this assignment, you will be asked to write several functions. Be sure to add documentation within your functions using Python comments to tell the user what the function is doing and and what inputs it can take. Also, be sure to use clear function names that tell the user what the function does. If you find it useful, you can review the Earth Analytics Bootcamp reference page on PEP8 Style Guide. In the questions below, you will be working with numpy arrays. You will also be downloading files using urllib.request and accessing directories and files on your computer using os. Last, you will also be creating plots of your data. Import all of the necessary Python packages to accomplish these tasks. Each dataset contains a row for each year specified in the dataset name and contains a column for each month (starting with January through December). Use the appropriate function to import the files into new numpy arrays. Print your numpy arrays using the appropriate code to suppress the scientific notation. Note: you are not required to write a loop to accomplish this task. You can follow the same process that you have before to download and import files. You have a fixed number of items that you want upon which you want iterate the same code (i.e. the two numpy arrays you previously created). There are two attributes of numpy arrays that you can use to get this information. Imagine you work for NOAA, which you know publishes their precipitation data in inches, rather than millimeters. You have received new data in millimeters, so you need to convert these values to match your other NOAA datasets. Run your function on the numpy array created from monthly_precip_mm_1998-to-2017.csv to convert the units from millimeters to inches. Save the output as a new numpy array and print the numpy array. Imagine you work for NOAA, which you know publishes their temperature data in Fahrenheit, rather than Celsius. You have received new data in Celsius, so you need to convert these values to match your other NOAA datasets. Run your function on the numpy array created from monthly_temp_cel_1998-to-2017.csv to convert the units from Celsius to Fahrenheit. Write a function that calculates the sum across the rows of a numpy array. Recall which existing numpy function you can use to calculate a sum. You will include this function within the function you write to answer this question. Review the lessons on functions to see the use of axes to calculate a statistic across the rows or columns of a numpy array. Run your function on the numpy array containing the precipitation values in inches. What are the dimensions of the numpy array you created for precipitation in Question 9? How many values does this numpy array contain? How do you know? Why does the numpy array you created for precipitation in Question 9 contain the number of values that it contains? What does each value in this numpy array represent? Write a function that calculates the median across the columns of a numpy array. Recall which existing numpy function you can use to calculate a median. You will include this function within the function you write to answer this question. Run your function on the numpy array containing the temperature values in Fahrenheit. What are the dimensions of the numpy array you created for temperature in Question 12? How many values does this numpy array contain? How do you know? Why does the numpy array you created for temperature in Question 12 contain the number of values that it contains? What does each value in this numpy array represent? Manually create a numpy array that contains the month names for January to December. Print your numpy array using print() to only see the values it contains. Review the practice with data structures activity to review how to create a numpy array manually. Write a conditional statement to check that the dimensions are the same between the numpy array created for temperature in Question 12 and your numpy array containing the month names created in Question 14. Using your conditional statement, print a message stating whether or not the dimensions are the same, so that you can plot these numpy arrays together. Compare the shape of the arrays, rather than the single value for the dimension. Recall the operator to check equality between two values. These arrays have the same shape and can be plotted together. Create a plot of your choosing to display your data from the numpy array created for temperature in Question 12 and your numpy array containing the month names created in Question 14. Be sure to add a title and label the axes with the appropriate units. For the title, think carefully about what this data is actually showing. Review your code that created this temperature array, so that you can title the plot appropriately. Begin your list with the conversion of the temperature data from Celsius to Fahrenheit and end it with checking that the dimensions between the numpy arrays were the same, so you could plot. Identifying what you do not already know is also very important in pseudo-coding a workflow. With this in mind, do you think it would be possible to create one function that accomplishes all of the steps listed in subquestion 1? What would you need to know how to do, in order to write one function that completed all of the steps? In your pull request message to submit this homework, include @jlpalomino in your message for the Pull Request to notify the instructor of your submission. Remember that you can edit a message for the pull request, if you forget to include it the first time. The message will be updated when you save the changes. Guided Activity on Version Control with Git/GitHub to add, commit, and push your Jupyter Notebook for Homework 4 to your forked repository for Homework 4 (https://github.com/yourusername/ea-bootcamp-hw-4-yourusername). Guided Activity to Submit Pull Request to submit a pull request of your Jupyter Notebook for Homework 4 to the Earth Lab repository for Homework 4 (https://github.com/earthlab-education/ea-bootcamp-hw-4-yourusername). This time include @jlpalomino in your message for the Pull Request to notify the instructor of your submission.